The McMillan Group has teamed up with Packages from Home (PFH), a non-profit organization dedicated to supporting our troops and their needs. The goal is to make the holidays a little brighter for America’s deployed troops serving overseas. McMillan has pledged to send a $100.00 gift certificate to all those who donate to Packages from Home. McMillan will be accepting donations (either goods or money) on behalf of Packages from Home. Here’s the deal: If you make ANY contribution to PFH, large or small, cash or goods, during November and December, you will receive a $100 McMillan gift certificate along with a receipt for tax purposes. The certificate can be used towards a McMillan gunstock or other McMillan product. This way you can save on gun gear while helping our soldiers serving far from home. 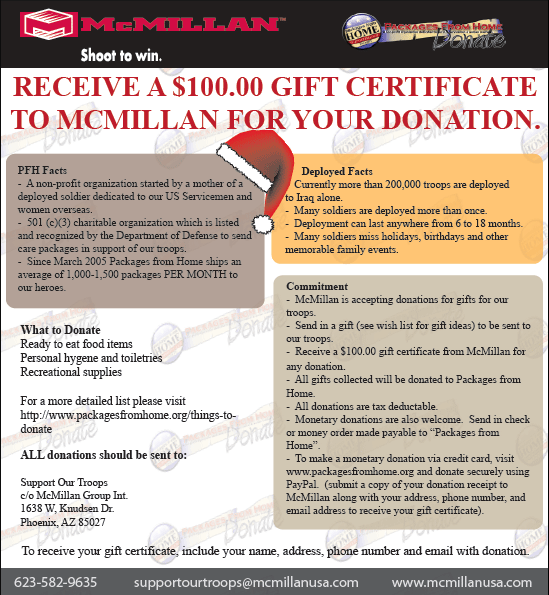 We salute McMillan’s efforts to assist Packages from Home in supporting our troops deployed overseas. For a list of recommended items to donate, visit the Packages from Home website. Share the post "McMillan Teams with 'Packages from Home' Program"
Last year, Superior Shooting Systems (David Tubb) introduced a new, plastic-tipped 111gr bullet. It was hoped this bullet would rival the performance of the popular 115gr non-tipped DTAC, while working better in chambers throated for 105-108gr 6mm bullets. The design looked good, but, according to Superior Shooting, the 111-grainer “did not meet David Tubb’s standards at long range, so it has been discontinued.” The existing stock of 111s has sold out and “the project has been cancelled”. 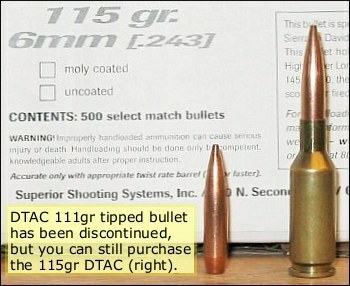 Superior Shooting does have ample supplies of the non-tipped 115gr DTAC bullet in stock. This bullet is a proven performer with a 0.580 BC (as tested). DTAC 115s are available both “naked” and coated with Boron Nitride, in minimum quantities of 500 bullets. The naked 115s cost $105 for 500, while the BN-coated 115s cost $110/500. That’s a great deal if you prefer coated bullets, when you compare it with the time and expense of coating the bullets yourself. To purchase, call 806-323-9488 or visit Superiorshootingsystems.com. From Superior Shooting’s home page, click on the “RELOADING” tab, select “Dies, Brass, Etc.”, then scroll down to find the DTAC 115 bullets at the bottom of the page. Share the post "Superior Shooting Discontinues 111gr DTAC Tipped Bullet"
With the Presidential election slated for tomorrow, it has never been more important for gun owners to band together and work as a group. The NRA may not be perfect, but it remains the most powerful organization working to protect the rights of gun-owners. If you haven’t joined the NRA yet, now is the time to do so. And Sightron has made it even easier. If you buy a Sightron scope, Sightron will pay for your NRA membership. Consumers who purchase any Sightron scope (excluding S1 models) before the end of 2008 will receive a free one-year NRA membership. Current NRA members will receive a one-year renewal with purchase. “With 2008 being a critical election year, all of us here at Sightron are concerned about attacks against our right to bear arms. We want to ensure that future generations have the same rights we have enjoyed”, said Sightron’s President, Scott Helmer. 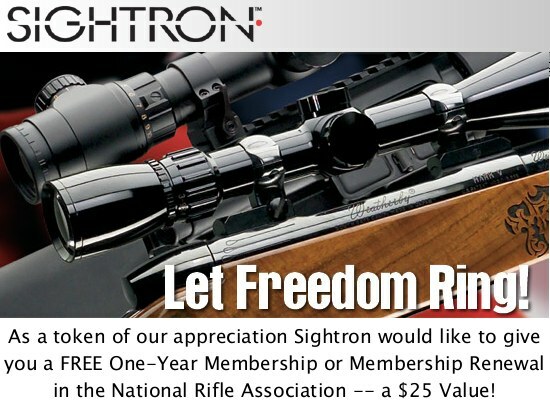 Share the post "Sightron NRA Membership Offer"